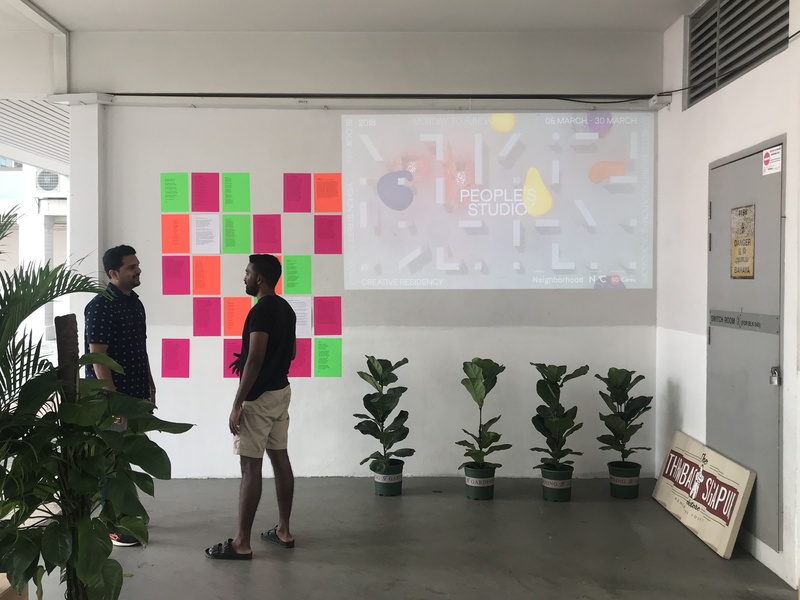 People's Studio is a creative residency programme that invites emerging artists and designers to spend one month at a makeshift pop-up space in the heart of Yishun in Singapore. Creatives-in-residence contribute to a multidisciplinary hub by proudcing and exhibiting 2D and 3D work as well as facilitating participatory workshops. Based on the theme "Future Living", they question existing boundaries of the local neighbourhood's built environment and social dynamics. The key tenet of the programme's collaborative atmosphere is the belief that youth-led community building can be achieved through socially engaged practice. 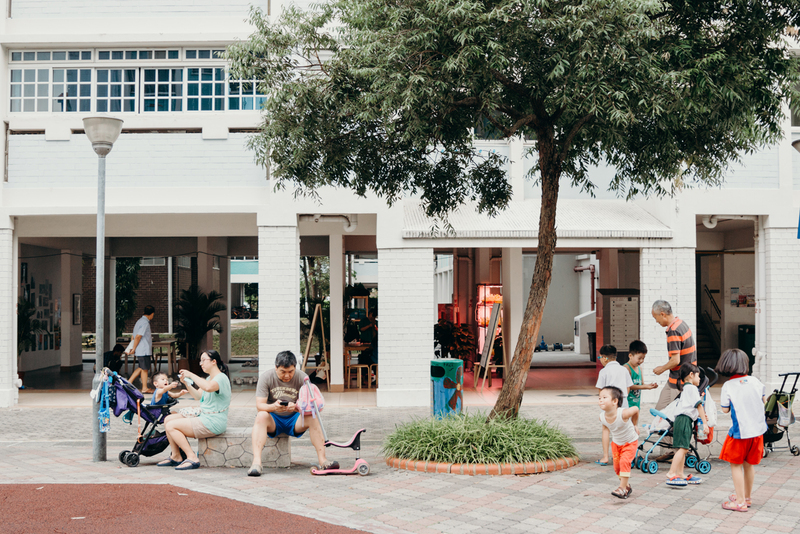 People's Studio ran from 5th March to 30th March 2018 at Block 844 near Khatib MRT, as an official Satellite Programme Partner of Singapore Design Week 2018. Subverting a traditional print poster, Neighborhood created an animated, moving visual for People’s Studio. The falling jellybean-like blobs symbolised the artists while the white columns characterised a simplified Google Maps aerial view of Yishun’s HDB residential estate. Throwback Singapura is a storefront signage for a frictional local bookstore that specialises in literature relating to the history of Singapore. Throwback – a term used to represent a reminder of the past, which explains my brand name, Throwback Singapura (Singapore). The signage also includes an illustration of Sir Stamford Raffles, a British statesman whose best known for his founding of Singapore. The signage was hand-painted on scrap metal from a cargo container.Marcus Gee is a multidisciplinary designer. He graduated with a BA in Communication Design from LASALLE College of the Arts Singapore in 2017. Co-produced by Neighborhood and LASALLE College of the Arts MA Art Therapy programme, HANDMADE was an interactive community arts workshop that linked themes of social wellbeing and mental health. Hands are important tools for creative self-expression and communication that are rich with metaphor, especially in the many ways that they allow us to actively take part in social activities with our friends, loved ones, and the community. From children to the elderly, various members of the community were invited to create a plaster cast replica of their own hand, or with their loved ones during this open-access workshop over four days. The casted hands were then arranged as a large onsite installation. HANDMADE simultaneously symbolises the collective identity of a community, and a personalised reflection of each individual situated within it. Participants helped themselves to their completed hand cast after the installation was over. Atypical is an artist collective consisting of Anna Scola, Calleen Koh, Hsueh Kai Ling, Lim Zeharn, Lim Zeherng and Ozborn Phua. The six artists are graduates of School of the Arts, Singapore. The collective is focused on creating witty public art using everyday objects, and have been initiating guerrilla exhibitions at unusual public spaces for the past two years. Atypical presented Dwellers #2, a group exhibition of mixed media, found objects and readymades that highlight the creative potential of a typical HDB estate. This gallery of NUS Architecture student projects addressed emergent needs arising from increasing global population and sea levels, waning natural resources, food supply and land scarcity. How these needs impact infrastructure, housing, healthcare provisions and production start with the way we manage waste, share resources, plan for food resiliency in our future communities, and facilitate cultural continuity with changing demographics.Projects range from building scale urban interventions in existing estates to the re-interpretation of entire settlements with renewable resources. Implicit in all interpretations of the future is the notion of sharing, continuity, inclusiveness and resource loops, which affect the physical planning of the entire community. 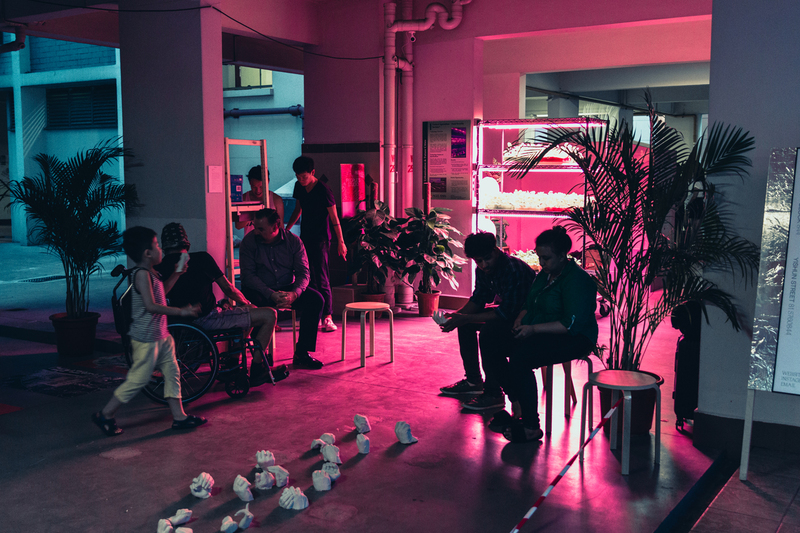 Ngee Ann Polytechnic’s Diploma in Landscape Design & Horticulture LDH presented an LED hydroponic installation, as an alternative to traditional HDB corridor gardening. Chinese Cabbage and Japanese Mustard plants were grown indoors under artificial modified LEDs for the duration of the programme. The seedlings were inserted in sponge, and then placed in plastic containers that are readily available in hardware stores. Fertilisers were maintained weekly through water culture.They also presented Ovalis, an oval-shaped decorative pot made from porcelain to create features on green walls for DIY enthusiasts. It could be hung from the ceiling, or hooked onto the wall. The pot has a water reservoir to minimise the need for regular watering of the plants and an overflow channel to discharge excess water. 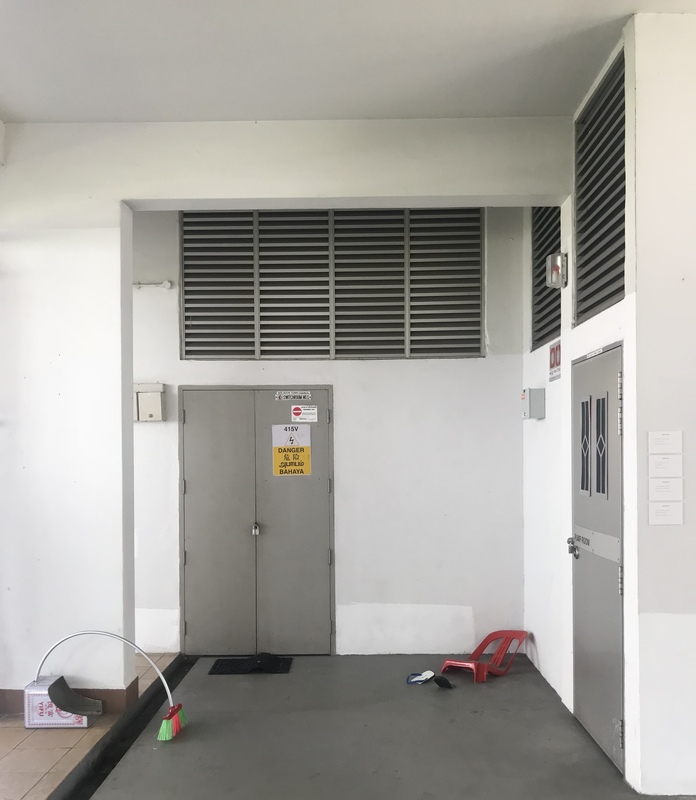 Mynah is a long-form print magazine that is interested in Singaporean stories that have yet to be told: those that lie forgotten at void decks, unnoticed in your phone’s camera roll, and stashed away in parts of the city that our transit lines still can’t reach. Mynah doesn’t set out to subvert, but they’re not opposed to subversion by accident. Above all, they want to dust off another facet of what this country is about by helping to tell authentic stories you can’t wait to share. 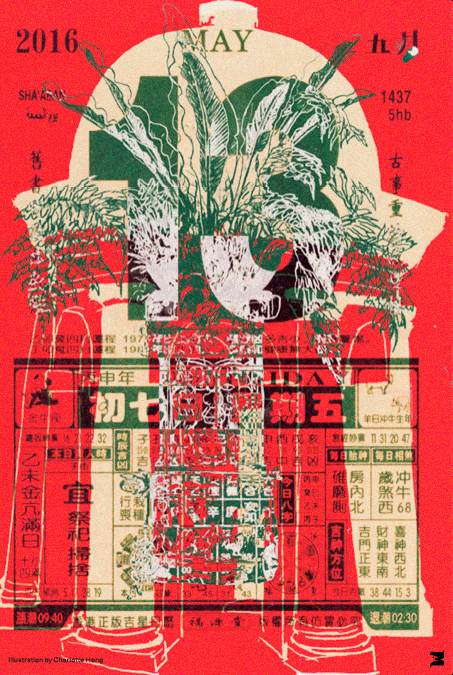 Mynah presented a series of posters that were extracted from Issue #2. Youths in Balaclava, or YIB, is a collective and an emerging Singapore-based fashion label. The collective began as a group of six friends aged 18 to 23 looking to channel their anarchic energy through style, music, art, and street culture. In 2015, YIB launched a couple of tees. Since then, they have produced three collections: “Traitors 2 Society”, “Twisted Paradise” and “Stigma”. In 2018, YIB become a new undertaking by Dover Street Market. The first chapter was a launch of a photo documentary book by photographer Ryan O’Toole Collett. 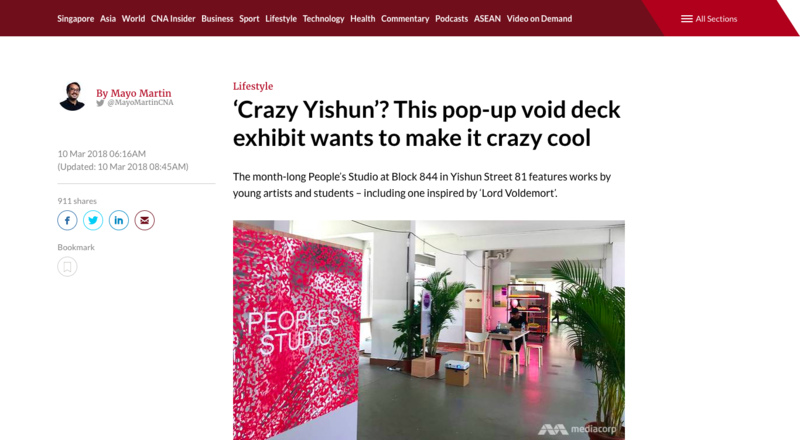 YIB presented a vision of youth culture in Singapore for the future, through a multimedia installation comprising photography, collage, and video. 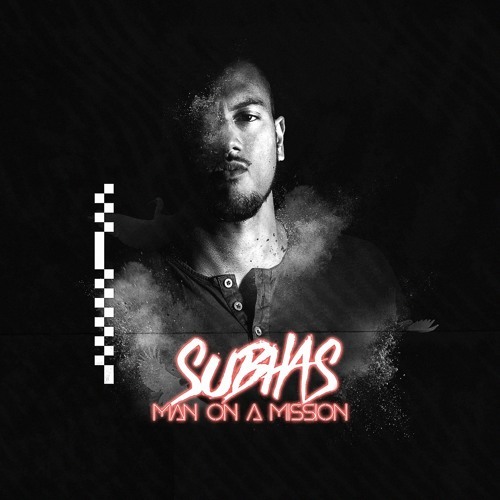 Writing and performing hip-hop music has always been a dream of Subhas. Growing up, Subhas would write raps on his palms, and notebooks. In May 2017, the moment he submitted his final paper at Yale-NUS College, he decided to pursue his dream. People’s Studio played his "Man On A Mission" mixtape, alongside his collaborators FAUXE's "before it's too late" album, and Cravism's "s h e 's o k" EP throughout the duration of the programme. His debut album "Not A Public Assembly" was launched in April 2018. People’s Studio went viral after Mayo Martin’s feature on channelnewsasia.com was shared over 900 times. Check it out here. Other press mentions include BURO 24/7, Coconuts, and Oli 96.8 FM as well as event listings on A List and Arts Equator. 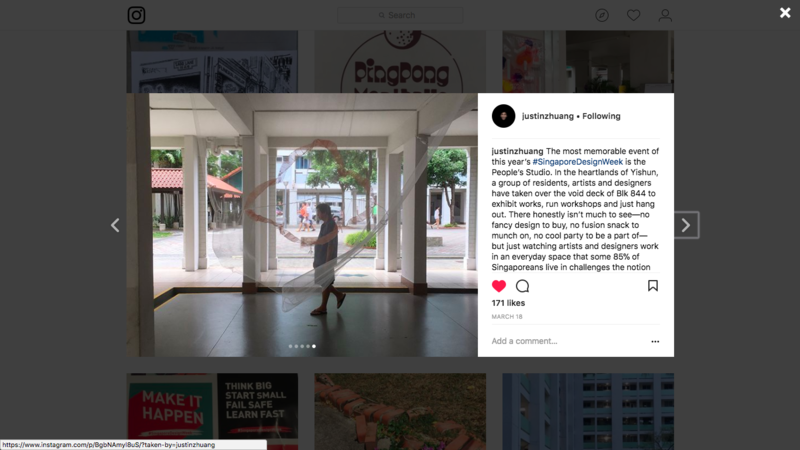 Curatorial tours, outreach at nearby secondary schools, and community consultation helped People's Studio garner over 99% positive feedback from visitors with plenty of footfall through word-of-mouth and shares on social media.